The biggest question from every ATA Show is, “What’s the best new bow?” But now that just about every company releases their flagship bow in the months prior, we get a chance to dig a little deeper. We had a list of the best new bows for 2019 that we wanted to check out, so in no particular order, here is our list of the best new bows of 2019. The SwitchWeight Technology is the easiest way to adjust your draw weight. This was the first buck taken with the Vertix by the Bowhunt or Die crew. Released in November, the Vertix has a 30″ axle to axle, 6″ brace height, weighs 4.6 lbs, and can shoot up to 343 fps IBO. The biggest difference from the Triax to the Vertix, is going to be in the new “Switchweight Technology.” This allows you to change your let-off and max draw weight in 5 lb increments from 60 to 75 lbs, by simply switching out a module. No more new limbs, no more need for a bow press. One of the other great improvements to the Vertix is the new “Engaged Grip.” It’s got a better texture, and you can be more consistent with where your hand placement is. The MSRP is listed at $1,099. You can find our full, in-depth review of the Vertix, right HERE. The Realm SR6 has an effortless draw that redefines what fast should feel like. This new bow for 2019 boasts speeds up to 352 fps IBO. For the speed and performance that comes with the Realm SR6, the smoothness of the shot is what surprised us the most. It’s 32″ axle to axle, has a 6″ brace height, weighs in at 4.3 lbs, and has max draw weights of 50, 60, and 70 lbs. This is definitely one of the bows that you need to try out if you’re looking at a new bow this year. It comes with an MSRP of $1,199 and you can check out our full review right HERE. The All-New Obsession TRAX Cam creates a whole new level of performance. The first thing that caught our eyes at the Obsession booth was all the different color pattern options. They’ve got 30 different options for riser color, and 17 different patterns for the limbs. At 30” axle-to-axle, the FX30 is designed with the stand and blind hunter in mind. The OB TRAX Cam supports let-off up to 85%. Combine that with a super light frame, the FX30 generates speeds up to 360 fps. It has a brace height of 6″, weighs only 4 lbs, and can come in max draw weights of 40, 50, 60, 65, 70, or 80 lbs. MSRP for the FX30 is going to be $999. The all-new ZT Pro Cam creates a balanced side-to-side load with the Split-Cable System. Despite a similar look as the RX-1, this is a completely new design for Hoyt. They widened the riser and moved more of the weight forward. The axle to axle on this bow is 30 1/2″, it has a 6″ brace height, and weighs only 3.9 lbs. This carbon bow is shooting up to 342 fps, and feels dead in the hand when being shot. Something new that they brought to the table this year was the ability to adjust the grip with an allen wrench. The RX-3 carries an MSRP of $1,699. The Prime Archery parallel cam system eliminates 99% of cam lean for better accuracy at longer distances. The Logic CT3 is a 33″ axle to axle bow with a 6 1/2″ brace height and it shoots up to 335 fps. It’s a continuation of their “Center Grip” bows, meaning that before adding any accessories, it’s already very balanced. Their signature parallel cam system eliminates up to 99% of cam lean, and helps the cams stay level while at full draw. Everything about this bow was designed for balance and the ability to keep the arrow level while traveling through the shot. It has an adjustable let-off, and it comes with a price tag of $1,100. The Kolorfusion process produces an incredibly realistic finish. The PSE Evoke 31 is the newest addition to the Evolve Series. When you think of PSE’s Evolve Cam System (ECS), it brings to mind unparalleled comfort and shootability with 90% let-off. But now PSE has engineered the ECS onto a caged riser for upgraded stiffness, strength, and 342 fps of shooting speed. The ability to adjust this bow now extends to the cam system. The let-off can be set at 80%, 85%, or 90%, and the draw weight can be set to 50, 60, 65, 70, or 80 lbs. 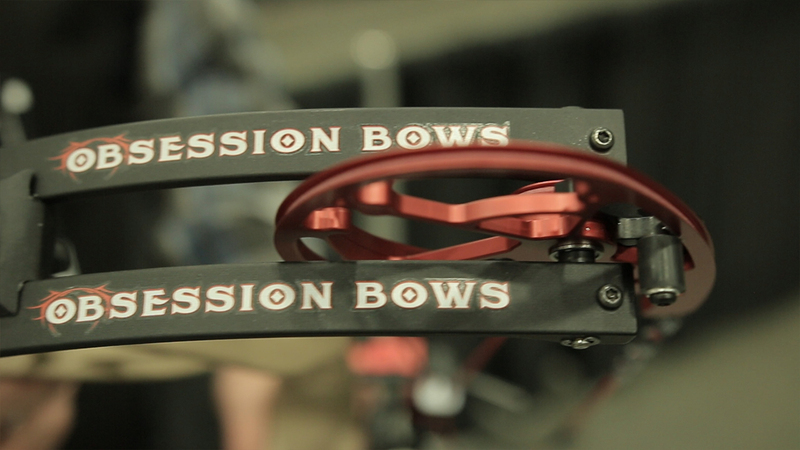 You can find this bow at your local PSE dealer for $999, or $1,049 for a Kolorfusion pattern. The Ritual 30 combines efficiency, smoothness, speed, and accuracy in one package. This new bow for 2019 is the second addition to the Ritual family after the 2018 Ritual, which was a 33″ axle to axle bow. The brace height for this bow is 6 1/2″, it’s shooting about 332 fps, and it weighs 4 lbs bare. Elite has been known for their smooth draw cycle, and steady back wall, this bow is no exception. It will retail at $1,000 and can be found online or at your local Elite dealer. You can find our full review of it HERE. Shown above is the Veil Alpine pattern, but the Kuma 30 also comes in 3 other patterns; Realtree Edge, One Nation Midnight, and Iron. The last of the new bows for 2019, is the Bear Kuma 30. Don’t let the $899 price tag fool you, this bow possesses great performance and unmatched forgiveness. Like the name states, this is a 30″ axle to axle bow, weighs 4.3 lbs, and has a 6 inch brace height. This bow has a strategically designed riser that’s been hollowed out to lighten the load, and can shoot at speeds of up to 345 fps.